To request any of Jackie’s services, click here. Jackie is an engaging on-air television talent. As a highly respected media authority and past national media spokesperson for the Academy of Nutrition and Dietetics, she’s appeared as a guest on over 100 television news and radio programs. Past appearances include ABC’s Good Morning America and World News Now, ABC News Now’s Healthy Life, CBS’s Up to the Minute, NBC’s Later Today and Dateline, MSNBC’s Morning Line, Lifetime Television’s Lifetime Live, Food Network’s Follow that Food, and The Dr. Oz Show. She was a recurring guest expert on Discovery’s Planet Green channel’s premier cooking show, Emeril Green. She’s often heard on the radio and internet radio. Interviews include Martha Stewart Living Sirius Satellite Radio’s Whole Living, WBT’s This Show is Cookin’, WIOJ’s The Ed Furbee Show, USA Radio Network’s DayBreak USA, American, Urban Radio Network, The Valder Beebe Show, and Cable Radio Network’s What’s Cookin’?, Ingles Information Aisle, plus various shows on NPR, CNN Radio Network, WOR Radio Network and Mom’s Radio Network. 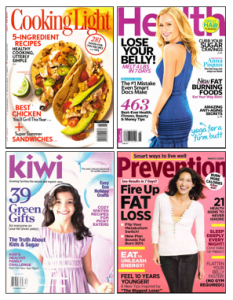 Jackie has been interviewed by hundreds of national print and internet media outlets including USA Today, Reader’s Digest, USA WEEKEND, Cooking Light, Fitness, MORE, Runner’s World, Organic Spa Magazine, WebMD, Chicago Tribune, thedailygreen.com, WomansDay.com, MSNBC.com, and ABCnews.com. 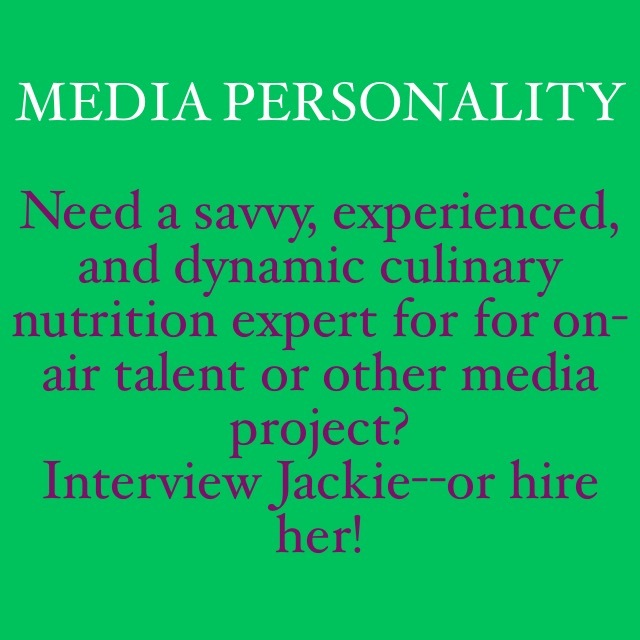 Jackie is sought after as a top spokesperson in the food and nutrition industry. 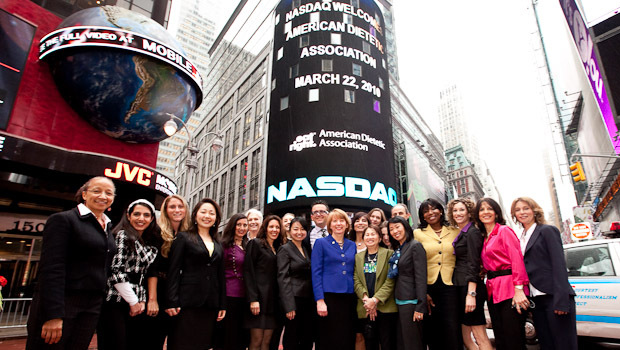 After her highly-visible role with the Academy of Nutrition and Dietetics as a national media spokesperson, she has represented dozens of companies and commodity boards. Below lists clients that she has worked with as a media spokesperson. 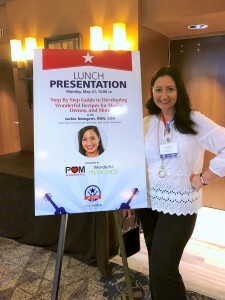 With a unique background as a chef and registered dietitian, she’s able to not just recommend what to eat and explain why, but also turn that information into practical, tasty and clever advice consumers can truly use. Disclosure: Jackie is currently a spokesperson for California Prune Board, the American Pecan Council, and KIND Snacks. 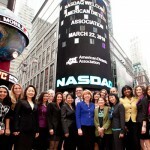 She is on the advisory board of Foodstand, Inc. 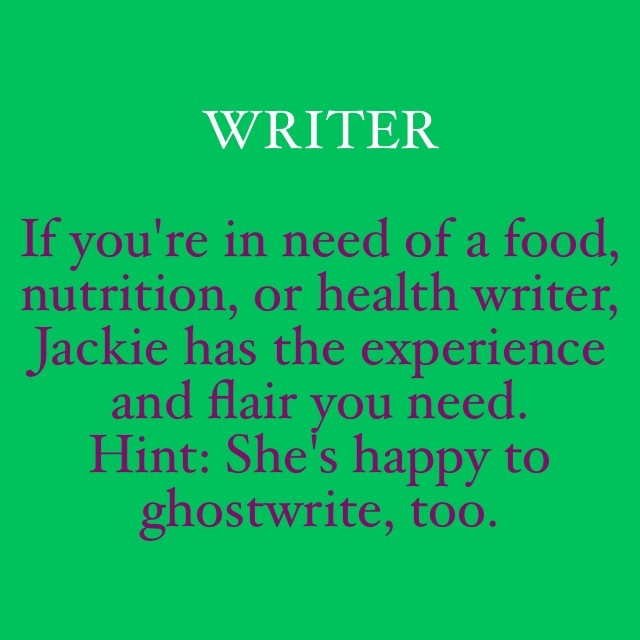 Writing is a passion of Jackie’s. She has a conversational writing style that everyone can appreciate. Jackie’s writing has appeal for professional audiences. But her specialty is successfully taking complex nutrition, health, food, and environmental research and adapting it creatively into consumer-friendly language that relates to how people really eat. Plus, she has the ability to go one step further—and write for teens and kids. 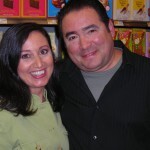 Her writing can be found in cookbooks, magazines, newsletters, brochures, blogs, and more. Check out her latest articles here. Taste always comes first in Jackie’s recipes. Her cuisine follows a “simple is delicious” approach, but her talent ranges the gamut from traditional to contemporary and straightforward to professional quality. 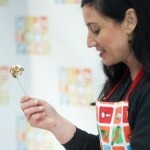 Her main focus is on high-flavor plant-based cuisine that’s natural, fresh, and nutrient-rich. Jackie has experience with foods from virtually all regions of the world, while her major influences are Middle Eastern and Mediterranean cuisine, especially since she grew up with a Lebanese mother who was a caterer. 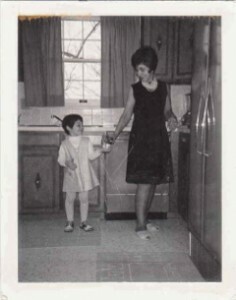 Yes, that’s her in the photo (see right) cooking with her mom in the 70’s! 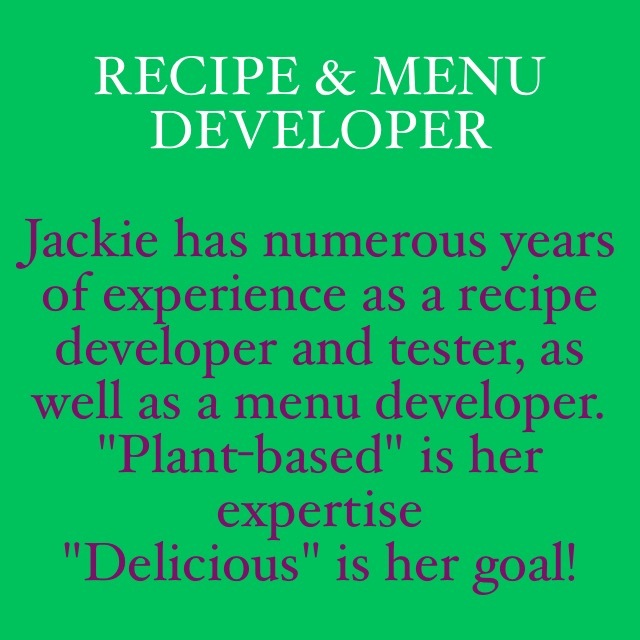 Basically, if your needs include recipe or menu development that’s 100% real, Jackie is your gal. 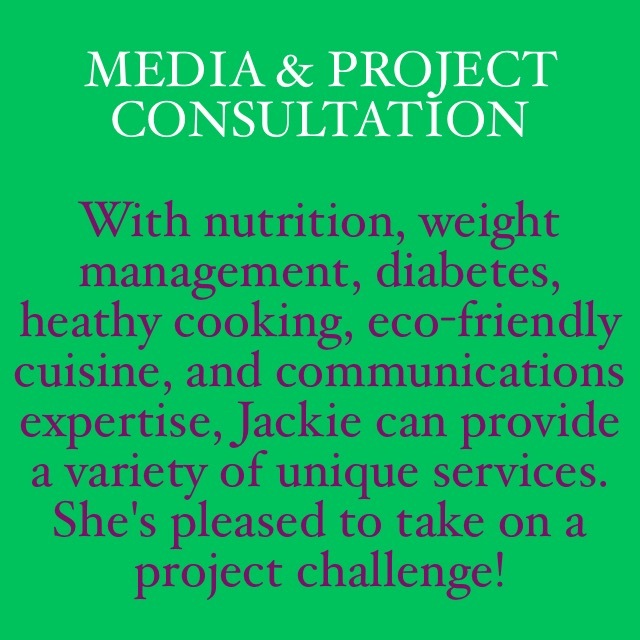 Some of media clients Jackie has recently provided recipe development projects for include Rachael Ray Every Day, Livestrong.com, and Fitbit. Some of the food industry clients Jackie has recently provided recipes as well as food photography services for include Wonderful Pistachios, POM Wonderful, The Mushroom Council, Sargento, and Almond Board of California. (Click on links to see a sampling.) To see other food photography by Jackie, simply check out her Instagram page. No project is too big! What’s more, Jackie is an expert at nutrition analysis. 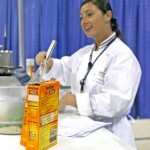 She has provided computerized nutrition analysis services for magazines, books, cookbooks, food companies, and restaurants. 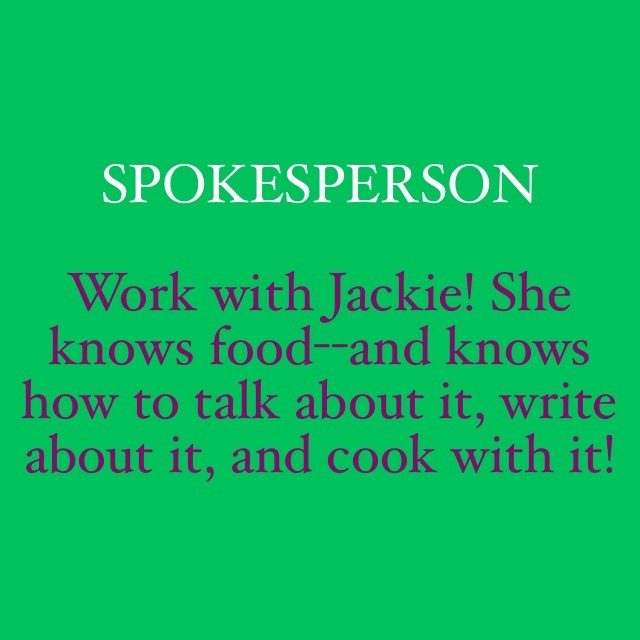 For more about her recipe or menu development, food photography and/or nutrition analysis services, contact Jackie at jackie@jackienewgent.com. 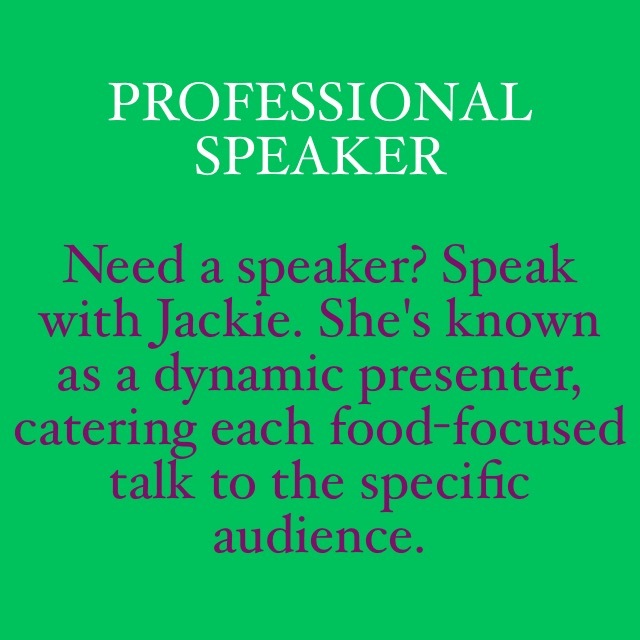 Jackie’s approachable speaking style is well suited to any audience: professional or consumer groups, kids or adults, and all food lovers. Chef Jackie can be hired as a private cooking instructor or private chef in her Brooklyn kitchen or your home, at your workplace, or for a special event. 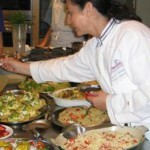 Her specialty is offering hands-on individual and group cooking lessons that are approachable, delicious, and fun. The menu chosen is fully customizable and personalized to meet health/diet needs, taste preferences, and cooking skill level. As a bonus, Jackie provides professional nutrition advice throughout the cooking experience, upon request. 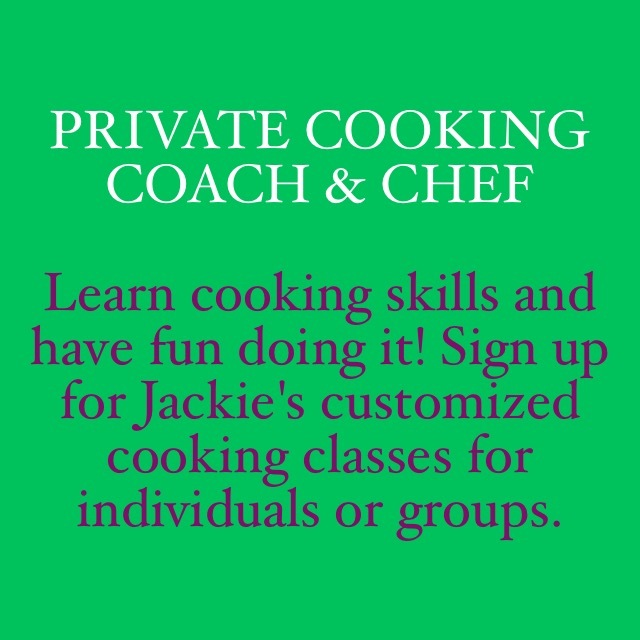 Please contact Jackie directly at jackie@jackienewgent.com or 917-225-5982 to request a personalized lesson or other private chef service. More details are available on Thumbtack and Romio, too. And there’s more! Teaching comes naturally to Chef Jackie as she’s passionate about cooking—as well as passionate about sharing her love of good food with others. She’s currently a specialty culinary instructor in the recreational division of The Institute of Culinary Education (ICE) in New York City. Her popular, hands-on cooking classes are open to the public. Sign up for one today by vi siting ice.edu, e-mailing rec@ice.edu, or calling 800.522.4610. Some of her signature classes include: Lean & Luscious Vegetarian; Superfoods; and Cooking for Fitness. 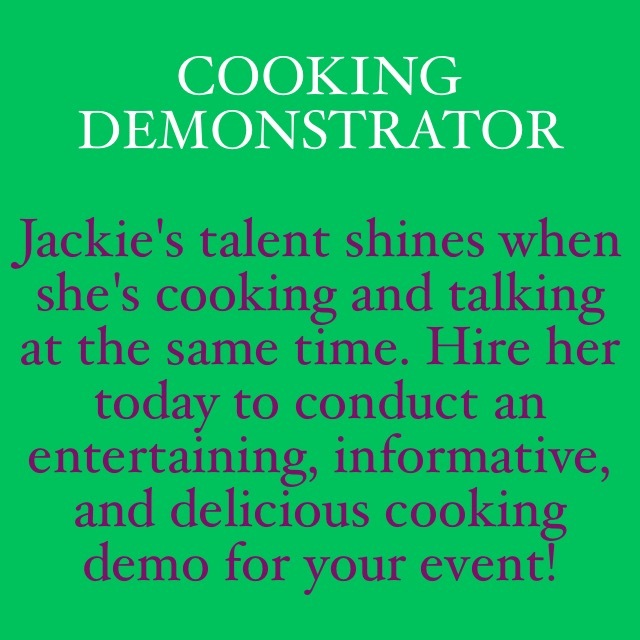 Jackie provides demos for professional groups, kids programs, health fairs, media events, employee wellness programs, philanthropic events, community expos, and more. Jackie has been leading wellness programming services to numerous companies in New York City and Chicago, including for Coach, Inc.’s Lunchtime Wellness Series and Johnson & Johnson’s Women’s Leadership Initiative. She’s known for providing effective health-promoting food- and nutrition-related services that she tailors to the specific needs of the organization and its employees. Her TASTETALKS—60-minute healthful cooking demonstration combined with interactive presentation—are her most requested wellness services; they provide appetizing appeal and entice employee interest in good nutrition and health. TASTETALKS can be tailored to the employees’ needs, specific holidays or company events, or used to supplement ongoing wellness or weight management programming. One of Jackie’s most successful and ongoing projects included nutrition and culinary consultation for the national after-school healthy eating and physical activity program, Healthy Children Healthy Futures, where the 8 Habits of Healthy Kids® were created. Other projects have included radio script development for the advertising firm, Brush Art Corporation, and nutrition consultation for the national award-winning PBS television show, In the Mix.